Properties are members that provide a flexible mechanism to read, write or compute the values of private fields, in other words by the property we can access private fields. In other words we can say that a property is a return type function/method with one parameter or without a parameter. These are always public data members. It uses methods to access and assign values to private fields called accessors. The get and set portions or blocks of a property are called accessors. These are useful to restrict the accessibility of a property, the set accessor specifies that we can assign a value to a private field in a property and without the set accessor property it is a readonly field. By the get accessor we can access the value of the private field, in other words it returns a single value. A Get accessor specifies that we can access the value of a field publicly. C# language has the three types of properties Read/Write, ReadOnly and WriteOnly. Let's see each one by one. We create an example that is used for the Name and Age properties for a Person. So first of all create a Person class then we will use this class in an executable program. The following code snippet for same. Now, this class is an executable program by creating an object of the Person class. It is VS intellisense that automatically shows object properties when we enter the dot (. ) operator after an object. In the following figure we can see Age and Name properties of a Person. Now executable class reads and writes values for the property. The following code snippet for same. Now, runs the application and result shows as per below figure. Let's see the line of code. 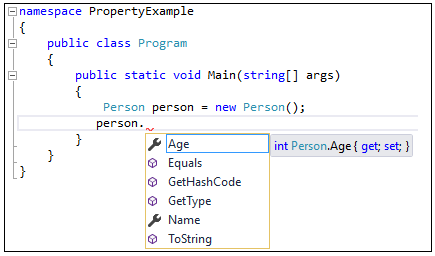 This line of code is called a get accessor of the Name and Age Properties in the Person class, in other words we can access the mName and mAge private fields by the Name and Age Properties respectively because the Name property get accessor returns a value of the private field mName and same for Age property. So the private field is accessible by the property. We can also create a read only property. Read only means that we can access the value of a property but can't assign a value to it. When a property does not have a set accessor then it is a read only property. For example in the Person class we have a Gender property that has only a get accessor and doesn't have a set accessor. The following code snippet for updated Person class. So the Gender property of the Person class always returns a value and can't assign a value to it. We can also create a write only property. A write only property is a property that assigns a value but can't get that value because that property doesn't have a get accessor. For example we have a Person class that has the property FirstName that has a set accessor but doesn't have a get accessor so it is a write only property. The following code snippet for Person class. As the write only property is created that’s why its value can’t be accessed. We can also assign values to properties when creating an object of the class. For example, we create a Person class object then we can assign the Name and Age properties to the person object. The properties of object are a block defined by curly braces and in the block each property will be separated by a comma. We can also create auto mapped property. When we create auto mapped property then we don't need define to local private field in get and set accessors. For example we have an Employee class which has two properties one in EmployeeId and another is Name. To define these properties, we don't need to create private field for these two properties and directly declare it. The following code snippet for Employee class. Now we access Employee class properties in executable program as per following code snippet. Now, runs the application and result shows as below figure. We can validate a value of a property before it's set to a variable, in other words we can check a value to be assigned to a private field and if it is correct then it will be assigned to the private field otherwise it will give an error. Suppose we are citizen of India and participate as a voter in a parliamentary election so your age must be greater than or equal to 18 otherwise we can't cast our vote. To implement this function we have a Voter class and that class has an Age property. The Age property can have a value greater than or equal to 18 otherwise it will show 0(zero) for the age with a message. The following code snippet for Voter class. 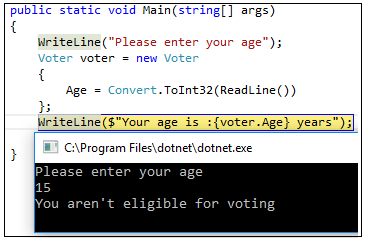 Now, assign an age value of a Voter in the executable class as per following code snippet. Now, runs the application and enter a value less than 18 then message shows with 0 years. We enter age value 15 and result shows as per following figure. In the output screen above we get a message from the set accessor and the value isn't set in the private field so we get a default value of the private field that we already set 0. Don't be confused by the message and return value. Here set is not returning a value. It is just printing a message on the console before get accessor calls the Age property. The following picture shows the message shown before calling the get accessor. We can also use a property instead of a method that has one parameter and a return value. Because a property can have custom logic in the get and set accessors. Now create a program by which we can input student marks. The following code snippet for same. Now, enter more than 80 marks and get the total marks with bonus as shown in below figure. The C# 6 serves auto initialize property that can be initialized inline. These are same as other but it uses an assignment operator, the value to initialize the property. The inline property statement ends with a semicolon. We can directly assign the value of the property at the time of defining the new property. Let’s see an example, We create an Employee class which holds two properties. The following code snippet for same. Here EmployeeId has only get accessor and assigned a value. It’s readonly property while Name property which assigned a value is a read/write property. Now, Employee class uses in executable program and assign value as per following code snippet. Now, runs the application and result shows as following figure. This article introduced that how to use a property in the application design. A variable stores value while a property uses as a method which performs operations on data and returns a result value. It also stores value same as a variable.